A furious feud has broken out in the NASA coalition as affiliates fight over positions and accuse Raila Odinga’s ODM of bullying. Raila’s party and its affiliates are alleged to be making far-reaching but unilateral decisions without involving the partners. Yesterday, top leaders of affiliate parties traded barbs over the coalition’s status and cohesion, blaming each other for deteriorating ties. The situation has been worsened by the alleged ‘skewed’ sharing of leadership positions in the Parliament where ODM is accused of short-changing partners. Ford Kenya secretary general Eseli Simiyu accused Minority leader John Mbadi and Minority whip Junet Mohamed both Raila lieutenants of wrecking the coalition. The two are said to have schemed to elbow out ANC, Wiper and Ford Kenya from the helm of key opposition-controlled committees. “ODM is failing to consult, especially in the National Assembly where if the Minority leader and the Minority whip are going to leave on their own, they are going to break up the coalition,” Simiyu yesterday told the Star. ANC secretary general Barrack Muluka also told the Star ODM’s failure to consult on important issues could kill the alliance recently plagued by internal fights. Muluka lifted the lid on the disquiet in NASA over Raila’s plans, saying Musalia Mudavadi’s party is being micromanaged. NASA is considered Mudavadi’s brainchild and he is said to be rebranding himself for a second stab at the presidency in 2022. Muluka hit out at the Orange outfit and warned it “will no longer be business as usual”. ODM chairman Mbadi defended his party against accusations of bias. He revealed ANC was not involved in Raila’s aborted swearing-in ceremony on December 12, Jamhuri Day. He said it was unfortunate such a “monumental” decision was being driven by a “cartel”, not the coalition. Opponents of Raila’s swearing in were given a boost yesterday when the US’s top envoy for Africa Donald Yamamoto reiterated America’s opposition to Raila’s oath-taking plan as the “People’s President”. “Forming a separate or parallel government is really unhelpful,” said the acting assistant secretary of state for African affairs during a teleconference with reporters. NASA postponed off Raila’s swearing-in on December 10. The postponement was announced by Mudavadi and Ford Kenya leader Moses Wetang’ula after a daylong meeting attended by Raila. 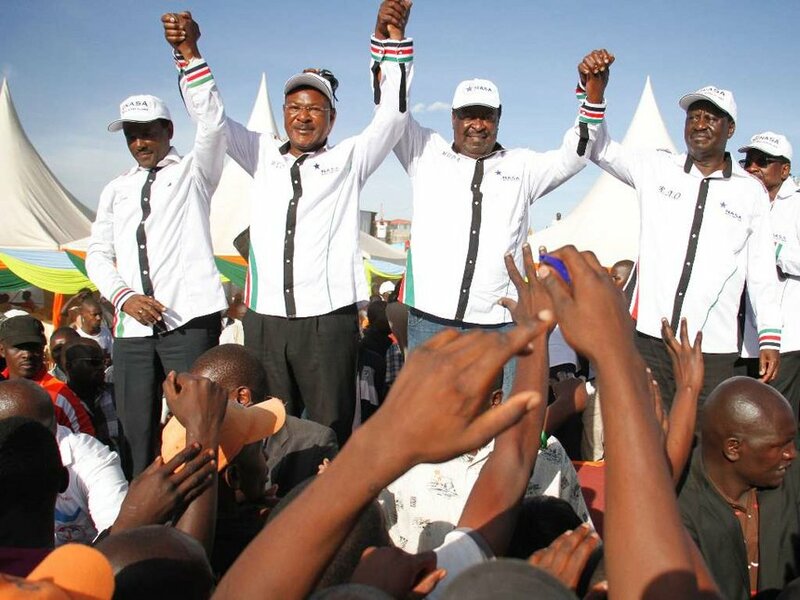 There were reports the two prevailed upon Raila to cancel the ceremony after the state declared it was treasonable and threatened to jail the former Prime Minister. ANC was also caught flat-footed over the launch of the Coast’s coastal region People’s Assembly. Dr Simiyu complained of unfairness. He is also the Tongaren MP and co-chairman of the NASA steering committee with James Orengo and Johnson Muthama. “If they feel the rest of us are a nuisance, then they should tell us now, then we know what to do next. There isn’t enough consultation, perhaps ODM doesn’t value the partners,” he said. He also criticised distribution of leadership of various committees under the opposition, accusing ODM of trying to grab everything. ANC’s Sakwa Bunyasi (Nambale) was floored by ODM’s Opiyo Wandayi (Ugunja) in the race for chairmanship of the powerful Public Accounts Committee, despite protests. ODM had set its sights on the chairmanship of the critical Public Investments Committee after it fronted both Mvita MP Abduswamad Nassir and neophyte Embakasi East MP Babu Owino. Owino was prevailed upon to step down to vice chair, as it is understood ANC had laid claim to it. The race is now between Nassir and ANC’s chief whip Tindi Mwale (Butere), Wiper’s Rashid Amin Kassim (Wajir East) . “It is our hope Tindi Mwale will be elected chair and myself vice chair. It is a tactical retreat for our coalition to infuse new and vibrant leadership in the parliamentary committees,” Owino said. Mwale said he is confident of clinching the seat, which could leave the Coast caucus protesting. “It is true that we were shortchanged on PAC elections, as ODM did not honour the gentlemen’s agreement that put ANC’s Sakwa Bunyasi (Nambale) as the coalition’s sole candidate for the seat,” Mwale said. Muluka insisted ANC was “very aggrieved about what happened”. The sharing of leadership positions has exposed dangerous discord. The first to complain of being short-changed in the House committees was Kalonzo Musyoka’s Wiper Party. The party has written to National Assembly Speaker Justin Muturi, demanding one slot in the lucrative Parliamentary Service Commission on the strength that it is a parliamentary political party under Standing Orders. Wiper leader Kalonzo Musyoka had been expected to fly in yesterday, but he did not arrive. His presence was considered critical to addressing the rifts in NASA. Musyoka was expected to write another letter confirming Wiper’s status in NASA, enabling the speaker to make a ruling. NASA’s anti-Jubilee resistance push has plunged the opposition into a deeper crisis after two affiliate parties accused ODM of driving the plan without consultation.